What his accusers say about him are still in the realm of ‘charges’. They ‘claim’ he did despicable acts and humiliated them. He denies them outright and why not after they found nothing amiss in his personal or professional life after six investigations (they’re now into the seventh)? Why should I disbelieve what he is saying? “Listen, Allan, you better watch what you’re trotting out about the guy. You’ll be in for a lot of flak if you put that out there,” said the colleague, suddenly turning serious. I was convinced she wanted to shut me up and therefore threw the vicious threat about majority ‘liberals’ who wear their confused morality on their sleeves and pat themselves on the back for it. All my life, I have never gone with the flow. Why should I now? I have no image to be sullied. Bullies like her will not push me around to change my point of view, I told myself. I was bracing for a debate but she didn’t seem interested and suggested I put down my objections in print. I am determined to speak my mind on these pages even if the brave new world order of ‘liberals’ are out in force against me, digging in for a long fight before going to my corner. I appealed to my colleague’s sense of fairness (no pun intended) to refrain from making this a gender issue. Being a woman, she supported the alleged female victim, was my opening salvo. I am with Kavanaugh on the principle of fair play. It’s that simple. “Who are we to judge?” I continued, all biblical in my attempt to take the higher moral ground. “Do you know all the facts of the case? You were swayed by the hearing that saw Kavanaugh’s accuser, Christine Blasey Ford, now a university professor, alleging the judge pinned her on a bed and tried to take off her clothes 36 years ago when they were teenagers. She was tutored, she read a prepared statement that she was raped. “Assault,” she corrected me, her anger rising. “He held her down, tried to choke her! I was convinced,” she protested. “Yeah, I know,” I replied putting on my all-knowing air. The truth will set you free, it is said, but we — the media and the masses are doing everything in our power to deny the facts a decent chance to emerge from that allegedly drunken night with our differing, polarising and half-baked opinions. Brett Kavanaugh may have had a tipple too many during his school days. He was a wild kid who’s now a responsible adult. That’s so bad, said the liberals, who brought this up just when Kavanaugh was headed to the Supreme Court. Political timing from the deep state embedded in D.C., is my conclusion. But daddy, did you? One kid might ask Brett, if not now, in an awkward moment decades down. The 53-year-old might then be 83, dentures, bad knees. I’m interested in whether at that point, this has-been former Supreme Court judge (we’ll know soon) will lie to his adult daughter(s?) about his multiple sexual assault allegations. You keep hearing this Trump-echo, around office water coolers, from my colleague defending Kavanaugh: how these days, in this #MeToo climate, you can ruin a man’s life because of claims of something he may have done. Innocent till proven guilty, fine, but concede reasonable doubt at least? Why would so many people with no political agenda, who are not even in politics, make this up? If in the light of this case, people are all het up and resolving to be more careful, behave better, that’s good. And it’s not just men who have to be more careful. Least of Kavanaugh’s worries right now is his Wikipedia page: Deborah Ramirez, who attended Yale University with Kavanaugh, alleged Kavanaugh exposed himself to her and thrust his p— against her face after they had both been drinking at a college party during the 1983–1984 academic year. Kavanaugh said, “This alleged event from 35 years ago did not happen.” What did happen was that in 1983, he wrote a letter to friends, unearthed by The New York Times, in which he told his pals to sound off the neighbours, coz, like, there be “loud obnoxious drunks with prolific pukers amongst us”. 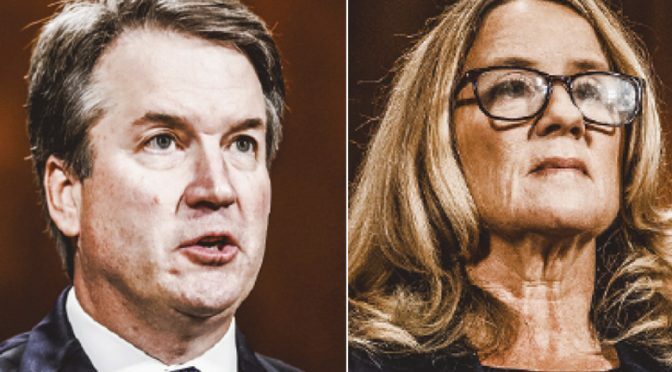 There’s a lot of noise about why Dr Ford is coming forward now, after all these years? Why did she not bring it up earlier? Timing is fishy, etc. Sure, it would have been nice if she’d told her parents about that night. It could have been dealt with. This man might have been made to feel penitent if he admitted to this behaviour, instead of going through life with a get-out-of-jail free card. But now is when it matters most. Stop holding it against women that they keep memories of assault to themselves for decades. It’s not easy for victims to start speaking, to trust that someone will believe them, empathise instead of suspect, making them feel shame instead of trying to understand. A Supreme Court nomination is a big deal. Character, credibility, ethics… even that dodgy concept — morality — ought to figure. Why is it so hard to believe Ford when she says it was her civic duty to speak up now when it matters most? Kavanaugh says the Clintons, these ‘Dems’ put these women up to it. I don’t get it. These women, besides Dr Ford are Deborah Ramirez and Julie Swetnick. Swetnick swore she went to high school parties involving Mark Judge and Brett Kavanaugh and that it was common at such parties for boys to prey on girls, sometimes by spiking or drugging the drinks so that the girls could not resist. High school parties, unchecked, can be wild. But you’re telling me these women are all malleable, cash-strapped puppets with no brains, zero integrity, that they were all bribed by the Dems to tell the media and the FBI lies about Kavanaugh’s predatory ways? I find it hard to swallow. It would be one thing if he were becoming CEO of some sneakers or tech company. And even there, very much so, NYT’s Nicholas Kristof’s point resonates: would HR hire a man with repeat sexual misdemeanour/assault charges? If you wouldn’t want him as a colleague, why bat for him to slither up to the Supreme Court? Deborah Ramirez. Why would she want the ‘limelight’, the media fallout that comes with alleging that naughty Kavanaugh as a teenager was shoving his thing in her face? It is a humiliating story for anyone to concoct. As for Dr Ford — “indelible in the hippocampus is the laughter,” she told the senators — why should she not bring up a basketball player’s hand over her mouth on a bed and laughter and his violation of her body and space? There’s a parenting lesson here. Girls deserve to feel comfortable to come out with this stuff earlier when it’s easier to verify the truth. And boys? Well, it’s a good thing such matters are being discussed and they are being made conscious of the idea of respecting girls. Kavanaugh’s ‘plight’ is a lesson in actions having consequences. No one is worse off for being reminded to watch their behaviour, even as teens, when you are not fully formed, when it’s easy to be egged on by your gang. I admit I am biased by how poorly Kavanaugh came across during his testimony. Restraint, a cool head, character. No sniff of sexual assault. Those would be desirable traits in a Supreme Court nominee. Not this belligerent, unfit, boohoo man boasting about how he ‘busted his tail’ to get to Yale —“That’s the number-one law school in the country,” he said, wide-eyed. Previous PostLearn from these villagers how to live long happy livesNext PostIf a hacker got to your account, what secrets would be exposed?